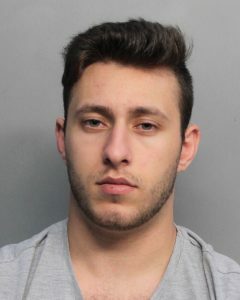 Haralambos “Bobby” Spiro Geroulanos, a freshman from New York, was arrested Feb. 23 for possession of cocaine, marijuana and prescription pills he intended to sell. The incident began when two RAs smelled pot coming from Geroulanos’ dorm in Hecht McDonald Tower. They called a night manager, who confronted Geroulanos and asked him if he had any illegal drugs in his room. Geroulanos went into one of the drawers in his room and pulled out 32 bags of pot, seven small clear bags of what appeared to be cocaine and three pill bottles containing Xanax, Adderall and codeine, none of which were prescribed to him. He also turned over $300 cash. University of Miami Police (UMPD) Officer Bill Gerlach said Geroulanos did not qualify for U-LEAD, the university’s pre-arrest diversion program with the State Attorney’s Office. The program only works for students who are under 21 found in possession of alcohol, students found in possession of marijuana under 19.9 grams or drug paraphanalia consistent with personal use or students with fraudulent driver’s licenses. U-LEAD does not cover cocaine or prescription drug possession. Geroulanos admitted to a UMPD officer that the drugs were his, and he was arrested and taken to jail but released the same day at 5 p.m., according to Miami-Dade Corrections. Floormate Calvin Chappell said he he did not know Geroulanos that well, but had been around him before. The freshman said some people on the floor knew of Geroulanos’ dealing but “not everyone.” In recent days since the arrest, Chappell said Geroulanos has seemed much quieter the few times he had seen him. “I haven’t really heard him playing loud music or anything,” Chappell said. Vice President for Student Affairs Patricia Whitely said she would not comment on the specifics of the case, but did say it was out of line with university policies. “It’s a major offense … but it shows that our systems we have in place work,” Whitely said, referring to the responsibility of RAs, night managers and UMPD to curb crime. Since 2013, there have been 56 drug abuse arrests and 376 drug abuse referrals on campus, according to crime statistics compiled annually by UMPD.